The City of Richmond deeply values sustainability and wants future generations enjoy the same sense of community that we do today. 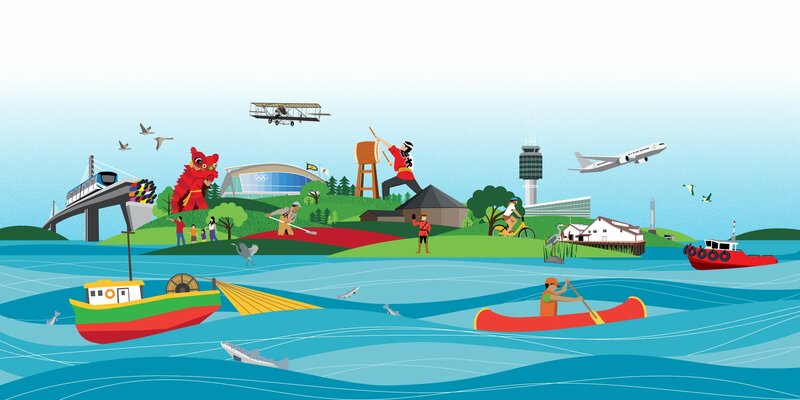 All Richmond Canada 150 events strive to follow Richmond Sustainable Event initiatives. Richmond Canada 150 is committed to fostering positive environmental, social, and economic impacts for current and future generations within the local community. Richmond’s Green Ambassadors will be on site helping event attendees properly dispose of their waste. Richmond’s portable water stations will be on site at all Major Events, meaning you can bring your refillable water bottle from home and have free, clean, fresh, and cold drinking water. Find the sustainable ways to commute to Richmond Canada 150 events. Public transit, cycling, carpooling and walking are all excellent alternatives to cars. Compostable, environmentally friendly wooden cutlery will be mandatory at all Major Events. All other forms of cutlery that generate excess waste will be banned. Keep an eye out for compostable napkins and plates. Finally, the Green Ambassadors on site will help you sort your waste appropriately. As you take in a year of celebration, please do you part to help make Richmond Canada 150 the a sustainable success.